Back in the 70’s when shock waves from the running boom spread across North America, women decided that they too were more than capable of lacing up their shoes and going however far their feet would take them. Led by pioneers like Kathrine Switzer, who was the first woman to officially register and finish the Boston Marathon in 1967, the women’s running movement has now caught up to and passed the men in terms of participation and marketing impact. Fast forward to today, there are many clothing lines for men and women with moisture wicking, lightweight fabrics that are so stylish, they are transcending the sport. Non-runners are dressing head to toe in stylish gear for sojourns to the coffee shop or the mall. Another pioneer who changed women’s clothing by creating a feminine design without sacrificing performance is professional triathlete Nicole DeBoom. The founder of Skirt Sports Inc. in 2004 designed a running skirt in which she competed and won the Ironman Wisconsin. 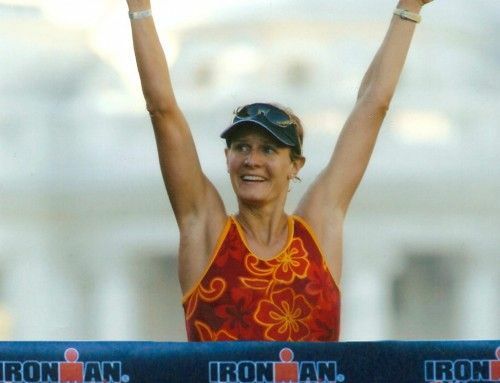 In a Q&A interview, DeBoom shares her passion for triathlons that began in 1994, having competed in over 100 triathlons of all distances from sprints to Ironman. She also talks about her rewarding post-athletic career as an athletic clothing designer. Q: When was your clothing line Skirt Sports created? A: In my former career as a professional triathlete, the athletic clothing options for women were very limited and uninspired. I often found myself training and racing in men’s products that didn’t fit or perform to my needs as a woman. In December 2003, I had what I call an epiphany run. I spied my reflection in a storefront window in Lyons, Colorado, and after realizing that I was incredibly uninspired in my boyish designs, I locked onto the concept of creating products that would actually inspire me to get out the door and take my personality with me, instead of leaving it at home! I launched the first skirts in February 2005. Q: How does your clothing line fit into a healthy lifestyle? A: Skirt Sports products are for real women’s bodies, something that no other brand can attest to. We help women gain confidence to take those first very difficult steps. Then we motivate them to keep going through our supportive community and inclusive perspective. Q: How does your clothing line compare to others? A: Our products are 100% inclusive. They are classic, timeless, beautiful pieces that help eliminate one of the barriers women face – lacking apparel options to help them get out the door. Sizing ranges from XS to XXL and product range from relaxed to semi-relaxed fits to accommodate more body types. From relaxing to running to celebrating, we’re here for each other and we highly encourage women to submit their stories of inspiration – the ripple effect of helping each other can be so powerful! Q: Tell us of your relationship with 261 clothing? A: We support Kathrine’s [Switzer] mission to empower women to break barriers in their own lives. Her bib number 261 in her inaugural effort to run 26.2 miles – has become a symbol for women to push through when the going gets tough. It takes confidence, strength, courage and a dose of fearlessness.